Quicksilver Scientific The One, Phospholipid Encapsulated Mitochondrial Optimizer, combines PQQ, CoQ10, Resveratrol, Phospholipids, and Herbs to create a powerful supplement. Purchasing this product today earns you 72 DR Reward Points! 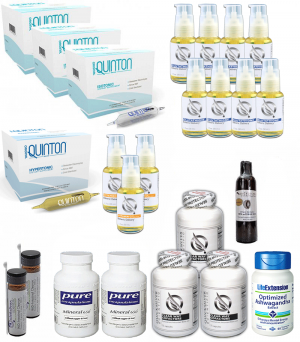 The One from Quicksilver Scientific is a truly revolutionary product which combines the mitochondriogenic and neuroprotective compound PQQ with its natural companion CoQ10. The blend also includes the metabolic efficiency master, Resveratrol. All of these potent ingredients are based in SunHorse Energy herbal adaptogens to form a single, very powerful package. 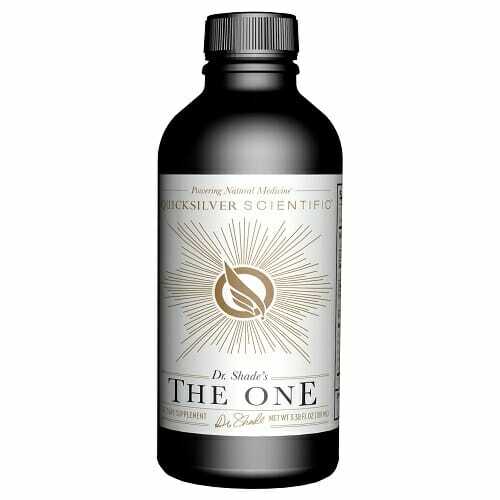 The One is a uniquely potent mitochondrial support supplement. Features a number of potent herbs and antioxidant compound. Adaptogens are natural substances which help the body to adapt to a variety of different stressors by regulating key hormonal balances throughout the body.9 They have also shown great potential in aiding the healthy function of the immune system and supporting a well balanced mood.10,11 Among the most common and potent of adaptogens are Ashwagandha, Ginseng Eleuthero (often referred to as Siberian Ginseng), Gotu Kola, and Astragalus, all of which are contained in the potent SunHorse energy herbal adaptogen blend. Take 1-2 tsps. per day. Bay be mixed into water. 1. Rucker R, Chowanadisai W, Nakano M. Potential physiological importance of pyrroloquinoline quinone. Altern Med Rev. 2009 Sep;14(3):268-77. 3. Stites T, Storms D, Bauerly K, et al. Pyrroloquinoline quinone modulates mitochondrial quantity and function in mice. J Nutr 2006;136:390-396. 4. Chowanadisai W, Bauerly K, Tchaparian E, Rucker RB. Pyrroloquinoline quinone (PQQ) stimulates mitochondrial biogenesis. FASEB J 2007;21:854. 5. Nakano M, Ubukata K, Yamamoto T, Yamaguchi H. Effect of pyrroloquinoline quinone (PQQ) on mental status of middle-aged and elderly persons. FOOD Style. 2009;21:13(7):50-3. 6. Curr Treat Options Neurol. 2009 Nov; 11(6): 414–430. 7. Celotti E and others. Resveratrol content of some wines obtained from dried Valpolicella grapes: Recioto and Amarone. Journal of Chromatography A 730(1-2): 47-52, 1996. 8. Am J Physiol Heart Circ Physiol. 2009 Jul;297(1):H13-20. doi:10.1152/ajpheart.00368.2009. Epub 2009 May 8. 9. Panossian A1, Wikman G, Kaur P, Asea A. Adaptogens exert a stress-protective effect by modulation of expression of molecular chaperones. Phytomedicine. 2009 Jun;16(6-7):617-22. doi: 10.1016/j.phymed.2008.12.003. Epub 2009 Feb 1. 10. Seely D, Singh R. Adaptogenic Potential of a Polyherbal Natural Health Product: Report on a Longitudinal Clinical Trial. Evidence-based Complementary and Alternative Medicine: eCAM. 2007;4(3):375-380. doi:10.1093/ecam/nel101. 11. Smirnova MD, Svirida ON, Ageev FT, Forfanova TV, Vitsenia MV, Mikhalov GV. [The ability to use meldonium as adaptogen in winter in patients with cardiovascular disease]. Kardiologiia. 2014;54(10):51-6.